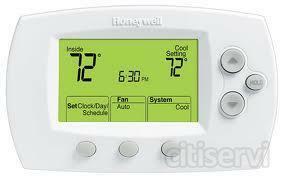 A Honeywell Digital Programmable Thermostat (Model # 4000 or 6000 - $200-$350 value) installed. PLUS a Comprehensive Whole Home Energy Audit (including air leakage testing, insulation inspection, duct leakage testing, HVAC Efficiency testing, Combustion appliance safety testing, appliance efficiency testing and MORE - $350 value) PLUS a Whole Home Infrared Camera Scan ($200 value) AND a comprehensive energy audit report with current usage statistics, improvement recommendations, and available utility rebates and tax credits. Call (480) 855-8789 to book an appointment and ask for more details! *All offers are subject to termination without notice. Speak to a Customer Service Representative for full details. Management Reserves all rights. Restrictions may apply. Not all qualify.